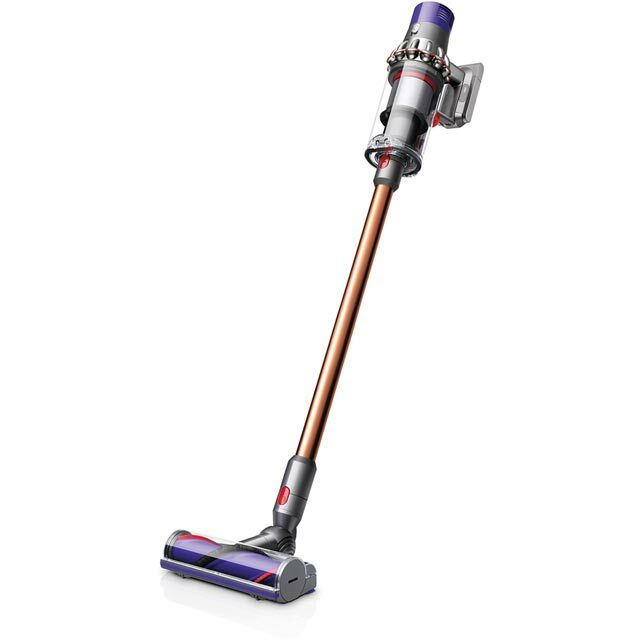 Enjoy incredible performance with this vacuum cleaner from Dyson. Because it can run for 60 minutes from a single charge, you’ll have plenty of time to get round the whole house. When it comes to banishing those muddy footprints, the direct drive cleaner head reaches deep into carpet fibres, effortlessly removing ground-in dirt. There’s a mini motorised tool as well, which has stiff bristles to pick up pet hair. With hygienic bin emptying, you won’t even need to get your hands dirty – debris will fall into the bin at the simple touch of a button. And, the docking station charges your vacuum while it’s being stored, so it’s always ready to use. Leave your hard floors looking like new with the brilliant soft-roller cleaner head. Because it’s made from woven nylon and anti-static carbon fibre, it’ll pick up large and small debris without leaving scratches on your floor. So, it’ll always give laminate and tiles a really gentle clean, leaving your home spotless without causing accidental damage. I am quite happy with this vacuum cleaner the only thing is I found it little heavy and sadly the hard floor brush doesn’t rotated so I can’t go under the furnitures. Quite simply the best vacuum I’ve ever used. Incredible suction power, even on the second power setting of three. The extra tools this comes with are useful, especially the small rotating head device, very good for hoovering the stairs. Yes it is quite expensive, but as long as it lasts several years then it is worth every penny. I have had this over a week or so now and it is far better than I expected I have two cocker spaniels and get dog hair everywhere but this vacuum does an amazing job and gets rid of them I use it on the medium setting at all times and last long enough to hover the whole house no problem I would recommend this to anyone may be abit on the expensive side but you get what you pay for especially with this!! Excellent rechargeable vacuum just like a standard one.